Many new decentralized forces have manifested themselves in our lives today. The Internet is one of the key drivers for the new global challenges. We are in a new phase for strategy and business performance. Many businesses and organizations have already recognized the power of these forces and have used them to unite and grow their businesses. These Level 7 companies have used these forces in their favor to help retain employees and effectively fend off competitors. There are also examples of how these trends are allowing organizational networks from all over the world to unite and grow synergistically at the same time. Changes in technology such as the proliferation of rapid Internet speeds, inexpensive hard drive memory, cellular Internet mobility and now Level 7 systems enable any company, large or small, to take advantage of what the successful �big boys� have had for years.� the opportunity to realize their organization�s true potential. Leaders need relevant, real-time, accountable information with increasing frequency, while at the same time connecting their employee networks. Lacking this, management is ineffective at being proactive to market pressures in an appropriate and effective manner. Level 7 systems provide your company with an opportunity to connect your people and your strategy with your daily tactical execution. Very few companies bother to do this, although nearly every company can. A recent study of companies by Marakon Associates found that on average, companies deliver only 63% of the financial performance predicted by their strategies. The companies that fared the best in the Marakon Associates study concentrated on planning and execution simultaneously, with clear linksbetween these two formerly isolated processes. 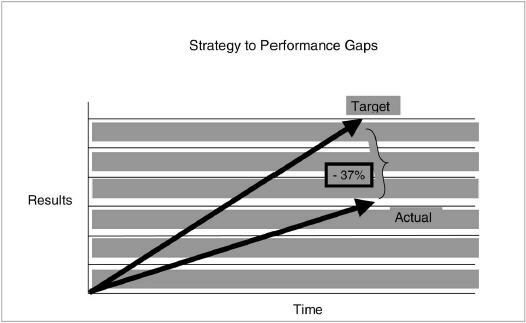 The performance gapsthat the researchers found include strategy and performance disconnects,tactical execution and accountability disconnects, process, systems, communication and incentive disconnects. 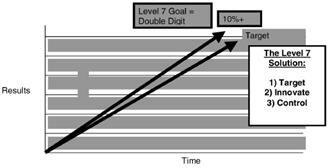 Reaching Level 7 will help you to strengthen control of your business priorities and show you how to tactically execute your priorities for improved results in the new business world.We will show you just what a Level 7 system can mean in terms of improved results in all areas of your business. Read on!